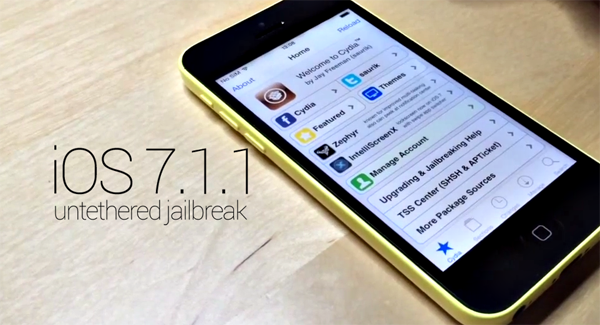 A few days ago, Stefan Esser, better known in jailbreak circles as i0n1c, revealed that he’d successfully performed an iOS 7.1.1 untethered jailbreak on his very yellow iPhone 5c. Following this exciting inroad, he then went on to explain how the single kernel exploit was achieved, and now, finally, he’s shown off a demo clip of his device booting up and running Cydia on iOS 7.1.1.
i0n1c’s revelation over the weekend served as the latest in a line of encouraging post-iOS 7.1 jailbreak progress. Winocm, who will be joining Apple later on this year in a move that will probably see the hacker retire from the Cydia community for good, demonstrated that a jailbreak on an iPhone 4 was possible. But i0n1c certainly raised the bar by showcasing an iPhone 5c jailbreak, especially given that newer processors are almost always more difficult to hack, and did so by effectively re-implementing a single kernel exploit found inside many iOS apps. Given that i0n1c is a veteran of the scene and one of the most talented security experts around, we never doubted the legitimacy of his claims, but to dispel any misconceptions or ambiguity, the hacker has thrown out a video of the jailbreak in action. He’s calling it Cyberelevat0r. Embedded at the bottom of this post, you see the iPhone 5c run through the Settings to reveal the version number, fire up Cydia, and then finally reboot, to prove its untethered nature. As ever, there are many folks on iOS 7.1.1 who’d love a jailbreak right now, but given how close we are to iOS 8, it may well be the case that these key exploits are saved for the future. The Evad3rs team already did a pretty darned good job of catering to iOS 7 in its early stages, and it’s arguable that those who wanted to jailbreak their devices badly enough had plenty of opportunity to do so. The iPhone 5s has also be jailbroken on iOS 7.1.1, but it’s highly unlikely that we’ll see a release of the jailbreak for public use any time soon like we’ve mentioned above. Anyway, check out i0n1c’s video, and be sure to leave your thoughts below. Downgrade iOS 7.1.1 / 7.1 To 7.0.6: Is It Possible?